As Ban the Box legislation becomes more and more common, employers need to be aware. These laws aim to give ex-offenders a chance to demonstrate their qualifications for a job opening before their criminal background is researched. 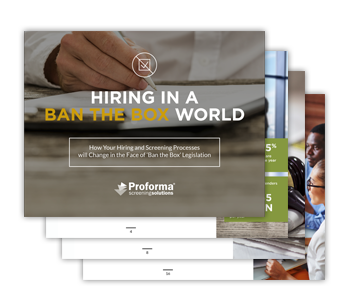 Ban the Box laws prohibit employers from asking about criminal background at the application stage of hiring, and then using the answer to determine whether to exclude an applicant. Beyond the basics, these laws can differ greatly across locations. Are you prepared to deal with the reality of these increasingly common and complex laws? Even if you are not subject to Ban the Box legislation today, why is it important to understand its impact? Finally, do your hiring and screening processes need to change? Get the answers to these questions and more in our latest guide. Complete the form on this page to download your free copy.